The Helen Woodward Animal Center event will trot for Casa Sol y Mar at the Del Mar Highlands Center. The Helen Woodward Animal Center event will trot for Casa Sol y Mar at the Del Mar Highlands Center on Sunday, May 21. CINCO DE MAYO-THEMED FIESTA: Did your tail-wagger go to prom this spring? No? Did you miss snapping sweet photos on the porch, and fixing his boutonniere, and posting on all of your social media faves? There's still a chance for your furry charge to attend prom, and they don't even need a promposal or fancy engraved invitation or any other reason to go. 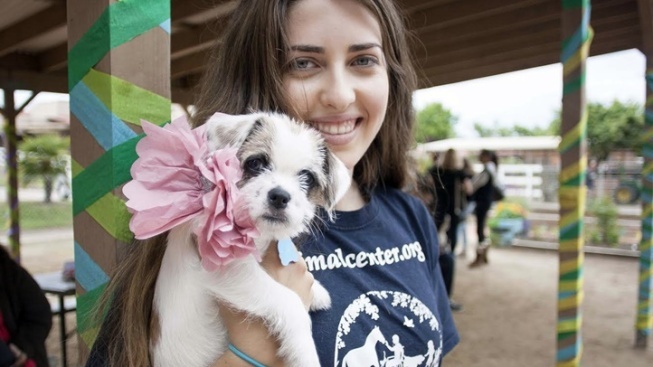 Here's the main reason behind Puppy Prom, and it is as sweet as the smell of a pup straight from a soapy bath: The annual Helen Woodward Animal Center event, which invites all alumni pups to get gussied up and come back to prom it up, is a fundraiser for the sweet, beastie-assisting organization. The first thing to note, though, about the 5th annual Puppy Prom is it is not, repeat not, happening at the Rancho Santa Fe center. Rather, you'll want to head for Casa Sol y Mar at the Del Mar Highlands Center for the Sunday, May 21 hound-happy hubbub, and you'll want to dress up your dog if you're so inclined. And there's a theme for 2017: Cinco de Mayo. "PROM COOKIES AND AGUA"... will be made available to the canine guests, while "free light Mexican appetizers" for the humans will be provided by Casa Sol y Mar (drinks will be available to buy). The prom is free for alumni of the center, so if you adopted your sweetie there, that's you and yours. To enter in the Best Dressed Prom Rey y Reina? That's a $10 donation, and, yes, that helps out the center. Other to-dos, from the making of corsages to the posing for photos, are on the morningtime roster. Oh yes, it's a late-morning kinda thing, so be at Casa Sol y Mar from 10 a.m. to noon on May 21. Happy proming, pups and pup-loving people!